Maximising hygiene is essential for minimising disease outbreaks and ensuring herds and flocks remain productive. But keeping bugs and bacteria at bay can be challenging and time consuming, with many cleaning agents failing to achieve full cleaning due to a lack of prolonged contact. Cling foam products, on the other hand, attain prolonged contact at the same time as reducing labour requirements and removing the need for pressure washers or steam cleaners to be used. How do foaming agents differ from normal cleaning agents? Foaming products cling to surfaces longer than normal cleaning products, aiding maximum contact between the cleaning product and surfaces being treated. Where can foaming agents be used? 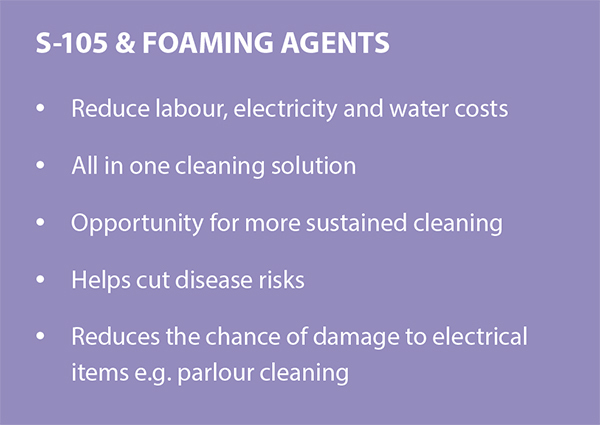 Foaming agents can be used in any situation where a standard cleaning product is used, including milking parlours, chicken houses and pig accommodation. How are foaming agents applied? 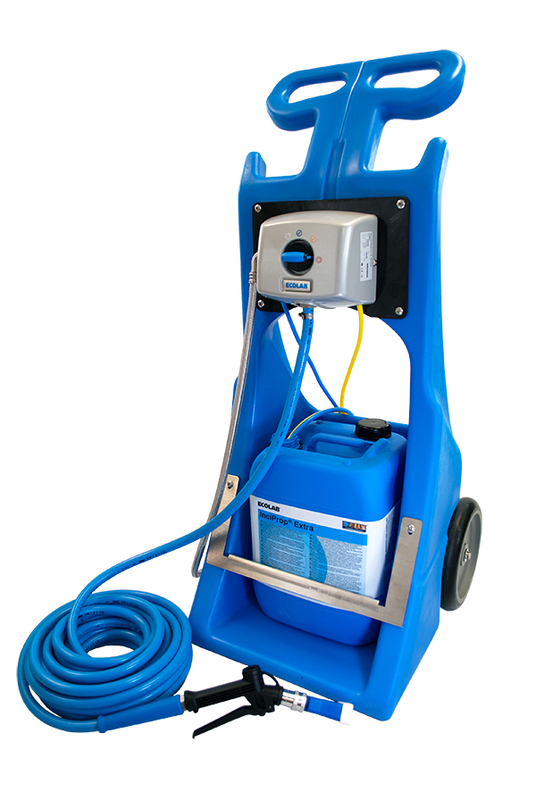 Foaming agents couldn’t be simpler to apply, they don’t require a pressure washer or any electrical equipment, being easily applied using an application system such as the Ecolab S-105 low pressure system from Progiene. If it doesn’t need a pressure washer how can it achieve as good a result as pressure washing? Foaming agents stick longer, meaning they have a longer working time and help to lift built on dirt and grime from a wide range of surfaces, including cow cubicles, parlour surfaces, poultry housing and pig buildings. Does the sticking aspect of foaming agents bring other benefits? labour savings in the region of 30% and water savings of up to 50%. 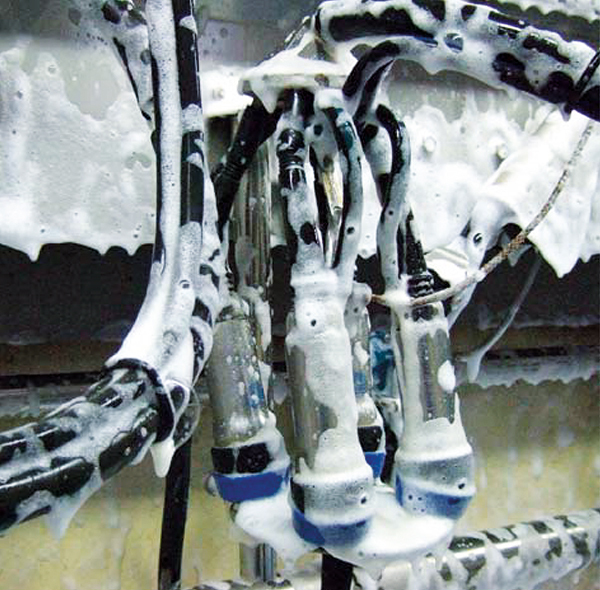 How does the S-105 spread the foaming agent without any electrical equipment? It spreads the agent by using water pressure, working with any pressure level from 2.5 bar, (normal water pressure) upwards to deliver the foaming agent across the surface which requires cleaning. Where can the S-105 be used? Thanks to not requiring an electrical supply to work then the S-105 can be used anywhere around the farm where there is sufficient water pressure. This makes it a highly versatile and adaptable cleaning option for any situation. Doesn’t it have to be mounted on a wall or other fixed surface? No, while the S-105 can be wall mounted it can also be used with an adapted trolley cart, making it fully portable. Does the unit need servicing or any routine maintenance? Because the unit is water powered it has very few moving parts, meaning it requires no regular servicing. However, in hard water areas there can be some water scale build up in the foam delivery hose. This can be easily removed with a descaling agent and should be done on a regular basis to optimise performance. What other equipment do I need to be able to use the S-105? No other equipment is needed. The S-105 is supplied with a foaming lance and trigger gun, meaning there’s no requirement for anything extra to be purchased. Are there any products in particular that the S-105 works best with? The unit can be used with any foaming agents, but Ecolab Inciprop Extra is one which is recommended for use with the S-105. It has been specifically formulated to both clean a wide variety of surfaces and also provide longer-term benefits. Does that mean it doesn’t need to be used as often as other cleaning products? Inciprop Extra has been formulated to leave an invisible film on the surface which aids the cleaning process making for quicker removal with further use. How often surfaces will need cleaning will, of course, depend on the circumstances on each farm and in each situation. What about disinfectants, can the S-105 be used for disinfectants too? Yes, the S-105 is ideal for spraying surfaces with disinfectant once any dirt and grime has been removed by the foaming agent. Does anything need to be changed to enable disinfectants to be used? Changing the foaming lance to a trigger gun is all that is needed to allow disinfectants to be applied. What other benefits are there to using the S-105? First and foremost, the main benefit is the easier cleaning it offers. Additionally, it saves money by requiring no electricity to run it. And, on top of that easier cleaning means facilities are more likely to be regularly cleaned helping them stay in good condition for longer and making for a better working environment.